The challenges consultants face warrant ongoing education. When those practitioners have 15- 30 years of experience dealing with messy realities, however, it makes little sense for faculty to teach clean-cut models in standardized curricula. We redesigned an 18-month Masters program to fit this group better. Looking back, two elements stood out that made the redesign successful: 1) encouraging practitioners to harness and stretch their practice through research, and 2) involving practitioners in the co-production of learning environments as a means to build their capacity for continuous professional development. Together, this approach resulted in a more complex program that raised the bar for participants and staff alike. The chapter describes the program design, underlying principles and lessons learned. The text can be downloaded. 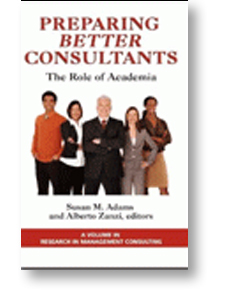 It is a contribution to the book ‘preparing better consultants’ that focuses on a relatively neglected area of management consulting, the education of consultants. In today’s business world, we find training programs provided by consultancies, certification programs provided by professional organizations, on-the-job training of consultants with formal or informal supervision, self-taught professionals, and some academic programs and courses. Is that enough? No, better consultants are needed to handle the complexity and changing nature of business. Academe is in the best position to provide the critical thinking preparation necessary. Yet, academic institutions have been slow in embracing this challenge. The role of academia needs to grow in magnitude and in certain directions that educate consultants beyond industry training practices. Chapter authors like Ralph Grossman and David Boje provide examples of innovative programs, topical approaches for courses, and thoughtful reflections on the role academia can play in preparing better consultants. There are lessons for business schools, consultancies, and aspiring and practicing consultants.